I write a lot about depression. I have been there myself too many times although not for a long time now. I still have bad days and sometimes even a couple of weeks, but overall I haven’t experienced a serious case of clinical depression for over fourteen years. You will notice I used the word clinical. That’s because I believe, after much research, that only clinical depression needs to be treated with medicine. Having been diagnosed with clinical depression, I can tell you with surety that a true case of clinical depression is serious. It’s not just a few bad days. It’s not even a couple of “down” weeks. It’s a serious disease that needs to be carefully evaluated. So when I write about depression I almost always preface it with that explanation. Anyway…….. I read this article over at Brian Patterson’s Faithworks and I thought, hmm, I’ve never thought to discuss the connection between color and moods, particularly depression. I’ve talked to many depressed people over the years and the one color they almost all use to describe their depression is grey. I’m an aspiring artist and for those of you who don’t know, grey is a combination of the three primary colors, red, yellow, and blue. When all three are mixed together in various percentages, they produce cool or warm shades of grey. So when a depressed person uses a color to describe their depression, I find it fascinating that grey is the most used color with black, like “in a black hole”, the second. When I think about it further, it makes perfect sense that people would choose grey. Follow my thinking here. Depressed people have “flat” emotions. The medical term is called a “flat affect”. Flat affect: A severe reduction in emotional expressiveness. People withdepression and schizophrenia often show flat affect. People suffering depression don’t experience the red (excitement), the yellow (a warm feeling), and the blue (peaceful) of life. It has all blended together into this grey that overshadows everything reducing the vibrancy of life to suffocating grey. A depressed person doesn’t feel much of anything. Their facial expressions are “flat”. They are incapable of feeling all the “colors” of emotions. When I started painting I would paint with bright, clear colors on my paper. But because I was impatient and didn’t let the colors dry first, I would often add color upon color. I ended up with a muddy grey painting more times than not. My painting had no life, no vibrancy, no change of mood from one color to another. Such is depression. So that’s the first connection between color and depression-that most people, when asked to describe their condition will often use a color, mostly grey, to describe their mood. So next I wondered, can color really impact a person’s mood? There is a discipline called color therapy. Rather than giving you a long list, I would suggest you “google” the term and you will find lots of sites. 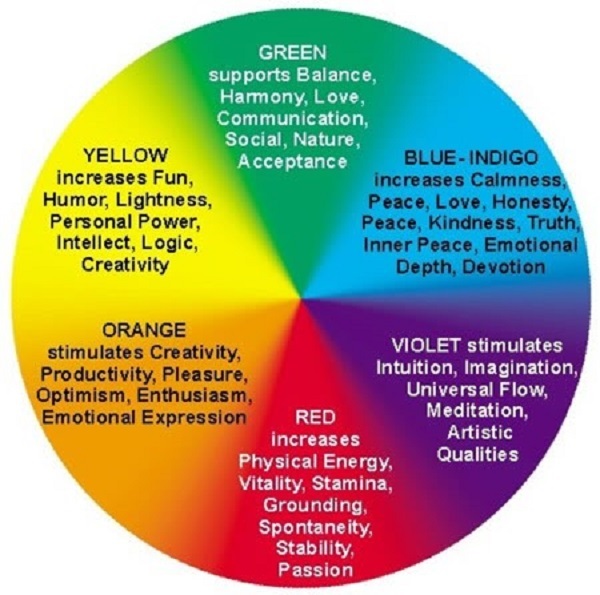 Whether or not you think it’s a valid approach, I think we can all agree that color does affect our moods. The colors one uses in one’s home could make depression. I’m not suggesting that changing wall colors or the colors you wear will alleviate a case of depression. But I am suggesting it’s one those overlooked aspects of our lives that were we to pay a little more attention to, it just might help. That’s the paradoxical side of depression. It’s complicated and simple all at the same time. And the treatment is complicated and simple as well. It has been my experience most people overlook the simple solutions. And there are many simple and easy steps to at least manage and reduce depressive symptoms. I’ve addressed many of these already. Color therapy is one of those simple steps that might be looking in to. And it struck me. God created a beautiful, colorful world for us to enjoy. But what did man do?